On the look out for a quick, easy and secure way of transporting your precious SUP cargo? Getting your board or boards on and off your vehicle can be a time consuming process. Factoring in weather conditions that can add some spice to the occasion like pouring rain, excessive wind or better yet pouring rain and windy you just don't want to waste time strapping your board down. Once it is strapped down you have to bear in mind not doing it too tight so you don't damage the board, the security aspect of the straps (non locking straps) and finally that the straps are going to hold the precious cargo in place and not fly off on the way. There are a wide variety of tie down straps available on the market ranging from simple d ring or metal buckle tie downs to straps that have key lockable clasps, stainless steel cord within the straps for security, Kanulok. The latter are becoming more and more popular as they allow the user to have a little peace of mind. Another product on the market is this offering from Inno, the SUP/Board/Kayak Locker from here on to be referred to as the “Inno’s” for ease of typing.. I was lucky enough to get my hands on a set of Inno’s from the Australian based distributer, David Hill, to review for a month. How did they fare? Read on discerning SUP'er. Once fitted it was time to test these babies out. I will be honest, the first time I used these I did not want to risk my expensive carbon board (especially given the current prices $$$$$) so the first test was performed with a Naish N1SCO ISUP. Now bear in mind that I own a Navara (largish 4 x 4 ute) which is quite tall and for me to tie a board down at any time I need to stand up on the side steps (I am 180cm tall - a shade under 6 foot). The Inno's are no different however after the first try I did need to modify how I get my board onto the car. Because of the raised nature of the racks and the design of the crane arm, you either need to raise your board up and over them and then slide the board under the Crane Arm or I instead loaded from the rear sliding the board onto the racks. This allowed me to easily get the board under the Crane Arm and not require me to awkwardly lift the board to stop it being scratched or dropped onto the racks. It is then just a matter of walking to the passenger side, attaching the cables onto the Crane Arm, release the ratchet lock and wind the cable in. The manual does state that the racks should not be stored in direct sunlight or high temperatures however I did not notice any issues in the time I had them on my vehicle which is parked permanently in those same conditions. Talking to David he has not had any issues with his in similar conditions. 2. That the board is secured to the vehicle in such a way that some light fingered individual can't easily walk away with your prized possession. 3. Once the board(s) are locked in the racks, the racks are also locked to the cross bars. Both pretty important points, let’s start at the top. 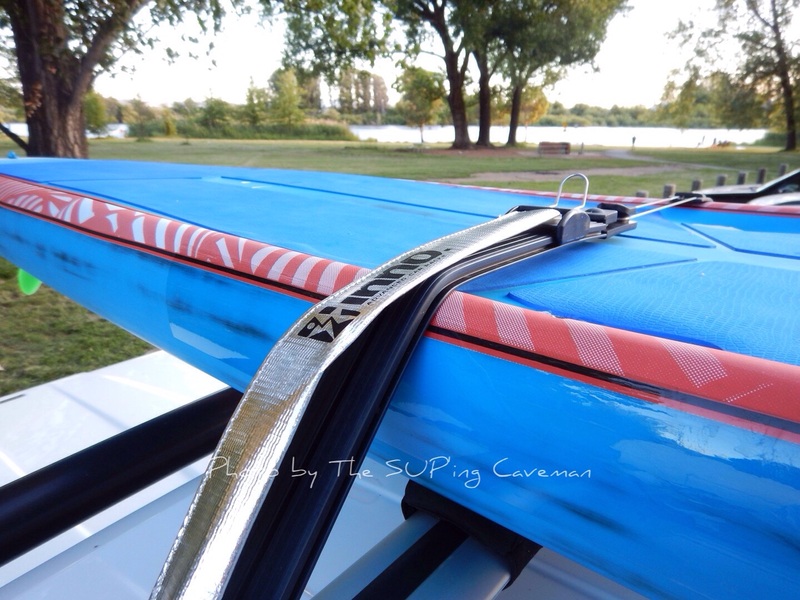 We have already identified that the racks are easy to use but, how secure are they during that all important transit to your favourite paddle location? In a word super secure. The ratchet mechanism is really easy to adjust and puts enough pressure on the board to hold it in place without possibly marking your board either permanently or to the point where you cut the board like a piece of cheese. Combined with the rubber pads that can be slid into place to protect the rails of your board, especially those steep rails on race boards, there was not a time where I was driving around and upon arrival had found that the straps had loosened of the board had moved around. When it comes to the light fingered members in the community I got a good first hand experience as I unfortunately misplaced the keys to my review set. Could I get into them? No way. They would not budge. Not the straps, the arms, the covers over the mechanism or the fastening bolts. I was not impressed by losing my keys but I was super impressed by the security. Now if you had bolt cutters and a hack saw you could no doubt do the job but you can say that for anything. Sometimes the best measure of how much I like and or enjoyed a product is by how much I miss it when it is gone. I find that the first week I am without the product is a good indicator of whether I want it or need it and how it helps my day to day paddling life. It most definitely applied to the Garmin 920XTand the Polar V800 watches and it now also applies to the Inno’s system. The first time I had to transport my board without the Inno’s, I really did miss them. The time saved getting the board off and especially on was something that I had started taking for granted. No need to muck around getting straps out as they are all there ready to go. Just slide the board on and lock it in place. Doesn’t sound like much but when it is a freezing cold day here in Canberra any reason to be back in the car with the heater blasting the ice off is welcome. Really important point to note though, I can see that this product is not idiot proof, nothing is. Just remember gently does it when you are tightening the ratchet straps up and make sure that the rubber sleeves are providing protection from the stainless steel cable that holds the board in place. Over tightening these straps is going to have the same possibly tragic end result as any other strapping/tie down option out there. 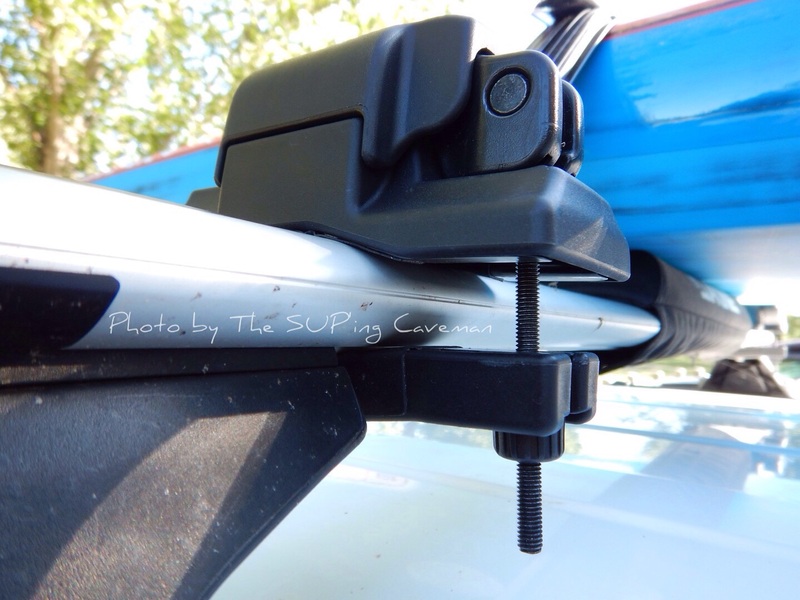 These are a very secure and easy to use board transport option that joins the previously released Thule and Yakima products as options for your SUP transporting needs in lieu of the previously mentioned strapping and tie down systems. Their use is not just limited to SUPs. Inno’s will carry 2 SUPs or longboards, or 3 short boards, or a sailboard, canoe, or kayak.